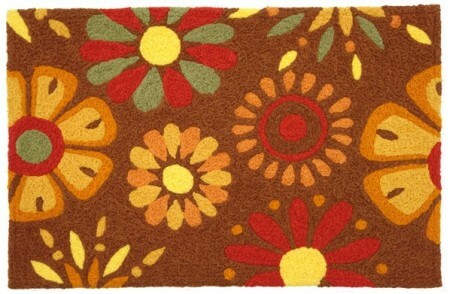 The Fall Colors Flower rug is great for welcoming guests. Accent rugs are a great way to bring together the design of just about any room or doorstep. They can be used as a focal point, or simply to add a splash of color. Depending on size and design, these kinds of rugs can be used in the living room, kitchen, bedroom or bathroom, and are great for welcoming guests into the home. Retro Planet’s new line of Jellybean rugs are perfect for jazzing up the doorstep or interior rooms. The line features a large selection of prints, patterns, and colors that cater to a broad range of tastes. The Retro Owl rug is great for the doorstep, kitchen or bar area. The attraction of Jellybean area rugs is versatility – they can be used indoors or outdoors (they won’t fade in sunlight), and are machine washable. So you can plop one on the porch or under your pooch’s dish without worrying about spills or dirt. In fact, the Jellybean tag line is “washes better than your jeans”. Unique retro designs make for great conversation. 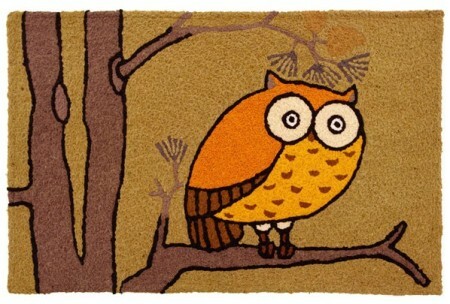 The Retro Owl mat makes a great accent rug in a bedroom and visitors are sure to get a hoot when used as a welcome mat. Or, if your New England home serves “lobstah” in the summer, the Lobster Rug is perfect for extending a warm welcome to all of your guests. For the western style home or basement bar, who wouldn’t love the Cowboy Silhouette area rug? 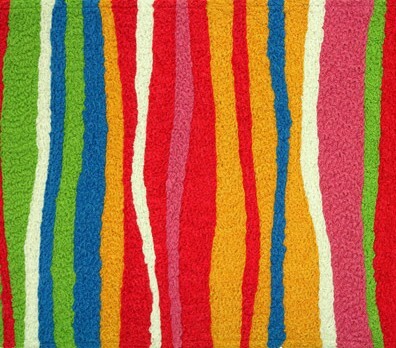 Add a splash of true color to the bedroom, kitchen or bathroom with a striped accent rug. For those who favor designs and patterns over pictures, the Fall Flowers doormat will add both retro style and seasonal charm to your November doorstep. For those on the wilder side, the Light Leopard Print area rug will contribute a little jungle atmosphere to your home. And fans of vivid color won’t be disappointed with the Bright Stripes doormat perking up the patio or playroom. Don’t be afraid to use these rugs in the bathroom, either. Since they’re designed to get wet, they can be used as large mats or to cover a chilly floor. And for those who like to shop eco-friendly, Jellybean rugs are made with 35% recycled material. Where would you use a Jellybean rug?